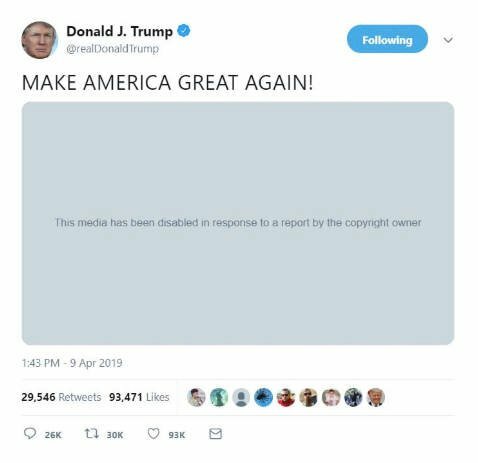 A video for President Trump's 2020 re-election campaign has been pulled offline for copyright infringement. The two-minute ad, which featured Trump walking around to a thunderous soundtrack that happens to be the score of the movie Dark Knight Rises, appeared yesterday but was swiftly taken down after the copyright owner – Warner Brothers – objected to its unauthorized use. The infringement was blatant. The only sound on the video was the "Why Do We Fall?" score written by Hans Zimmer and the video also used the same font as the film. It is remarkable that the White House comms team didn't seek to license the music, perhaps because they were concerned it wouldn't be approved. As for the video itself, it is like the trailer to a new season of a White House reality TV show, reflecting the president's background. It started with the MPAA green screen that often precedes a movie trailer – "The following preview has been approved…" - followed by aerial shots of Washington DC landmarks as the score kicks in. Then movie style headings: First they ignore you. Then they laugh at you. Then they call you racist. Short clips of Trump walking around factories, getting off Air Force One, attending rallies etc interspersed with snippets of Hillary Clinton, Barack Obama and celebrities that have been critical of Trump such as Rosie O'Donnell, Amy Schumer et al. Then footage of the Brett Kavanaugh hearing, headlines about the Mueller report finding there was no collusion with Russia and so on – all laid over the Dark Knight Rises score. Finally, more headings: "Your vote. Proved them all wrong." And the movie "title": Trump: The Great Victory. 2020. Just over two minutes. "The use of Warner Brothers' score from 'The Dark Knight Rises' in the campaign video was unauthorized," a statement produced at lightning speed by the movie company said, adding: "We are working through the appropriate legal channels to have it removed." And, thanks to the extensive IP protection systems that exist, that happened very quickly. Within a few hours, the Trump campaign video was gone and word searches for it now bring up TV news clips talking about the saga. You can, of course, still find the ad, even when reuploads of the video title it with clear references like "President Donald Trump 2020 Campaign New Trailer" – highlighting, yet again, that Big Tech's filtering systems are weak at best. But you can expect any versions to be taken as soon as they draw widespread attention. Here's one for example. But perhaps most notably, on the president's preferred medium of Twitter, a tweet of his linking to the video with the caption/catchphrase "Make American Great Again!" quickly appeared above a grey box with the title: "This media has been disabled in response to a report by the copyright owner." Trump's tweet has since been deleted. All of which is just another day in the life of a president who approaches his job in pretty much the same way he did when he was host of the reality TV show Apprentice; a show that made him familiar to millions of Americans. The video was well crafted and professionally produced and designed exactly like a reality TV show's trailer: fun foreboding, fast cuts, a sense of drama, inside jokes and a bet-you-can't-wait-til-next-season payoff. Although an entertainment company's lawyers would never have let the soundtrack get through without a licence - which in a strange way highlights the seemingly complete lack of norms and controls that exist around Trump and his team. The fact that the video is an actual re-election campaign for the office of president and not an upscale reality TV trailer is, of course, something that should cause anyone interested in the proper functioning of government to despair. But, that's just not where America currently is in 2019.